The global economic crisis has hit the CIS region especially hard, and prices continue to climb. Acute poverty has been rising, and jobs are becoming less and less available. Many people are becoming homeless, and even more families and individuals lack the means to purchase the basic food they need. The region’s harsh winters intensify the problems during those months. We are working to provide food for those in need, especially those who are most vulnerable—children and the elderly. NCM partners with several local churches that are supporting families and individuals in need through soup kitchens and the distribution of food packages. $25 will help provide warm meals at a local soup kitchen. $50 will provide a person with part of his or her food needs for one month. $150 will provide a food package for a family for one month. My granddaughter and I have been attending the church of the Nazarene for six years now. We like it here a lot. We like our pastor because she is very kind. When we have difficulties she prays for us and helps us, and the church helps us with food packages. This helps us a lot. There are three of us living together: my granddaughter, my daughter, and I. My daughter receives a small salary, and my granddaughter is still at school. I am retired. 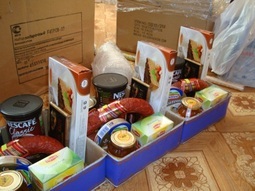 We stretch the food package we receive at the church for the whole month. Thank you very much for your help. Be sure to put ACM1728 in the Memo area. Thanks for your donation.